Chris Bake and his Team Aqua dominated the first day of the fleet regatta with two victories and two second places. The team from the UAE sits seven points ahead of Torbjorn Tornqvist’s Artemis and Igor Lah’s Ceeref after four races. The conditions were absolutely fantastic today for the first day of the fleet regatta, with 15-18 knots breeze and a very warm sunshine. Coming back to the top in style after a difficult match race, Chris Bake’s Team Aqua dominated the day and currently leads the overall ranking ahead of Torbjorn Tornqvist’s Artemis. "It’s a relief", said Bake at the end of the day. “We had a tough time last year in the Gold Cup and earlier in the week in the match race, so it is great to be back on top. In fact we all know how to sail well. Photo: Copyright Nico Martinez / RC 44 – A great start at the pin end for Team Aqua during today’s fleet regattas. Our main issue was to understand the mistakes we did and not to repeat them. Today our boat speed was great and we sailed well; I am very happy." Team Aqua started the day with a bullet, sailing conservatively in the middle of the course and extending its lead at every shift. Igor Lah’s Ceeref finished second whilst Paul Cayard’s Katusha, with Bob Little at the helm, managed to climb back up to fifth after a premature start. 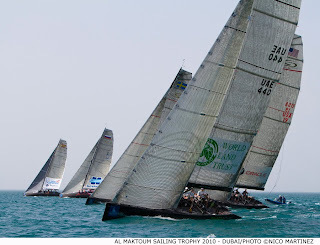 Team Sea Dubai was first to reach the second race’s top mark. They immediately jibed whereas all the other teams carried on sailing on starboard tack. The punishment was immediate, and Sea Dubai rounded the bottom mark in seventh. Team No Way Back benefited from this to take the lead and win the race ahead of Team Aqua and an excellent Team Austria. It was a nice revenge for the Dutch team, unfortunate in the first race when they got a knot in their spinnaker, finishing fourth instead of fighting for victory. The wind started to drop a little bit during the third race, becoming shiftier as the sun was going down. Katusha and Puerto Calero started at the Committee boat and immediately tacked to port whilst Team Aqua went to the left. Paul Cayard’s strategy initially seemed to pay, until a massive left shift gave the lead to Aqua. Bake then controlled his opponents, winning for the second time ahead of Katusha and a very consistent Ceeref. We improved a lot”, said the Slovenian owner and helmsman Igor Lah. “Especially in the pre-starts: our tactician Rod Davis made me work hard and it really paid off. However what I love most is the spinnaker rides, when we are surfing at full speed. It was very exciting." The last race could have cost a lot to Chris Bake and his team. Recalled for a premature start, Team Aqua rounded the top mark a long way behind the leader Artemis, and jibed immediately instead of following the pack. Seven minutes later, Team Aqua rounded the bottom mark in third, before overtaking Team Sea Dubai and finishing second behind Artemis. A great come-back! "Team Aqua did a fantastic job and I congratulate them”, said the Swedish team’s helmsman Torbjorn Tornqvist. "I am very pleased with our day", he added. “Our team is entirely new; there’s not one guy left from last year. So we are learning to sail together, and the guys need to discover the boat. Our results so far are very good." Indeed, Artemis is currently second overall, seven points behind Team Aqua and two points ahead of Ceeref. The fleet regatta carries on until Saturday, with eight more races on the schedule. There is still a long way to go.